Bidets are handy tools to keep you feeling fresh and clean all day. But did you know that bidets offer you more than that? An average person spends $55 a year on tissue paper and requires 384 trees to support his or her lifetime TP needs. Plus, he or she exposes himself or herself to disease-causing chemicals from tissue paper. So, your quest for the best portable bidet solves not only a personal hygiene issue but a range of problems as well. Let’s Get You Started on Your Search for the Best Portable Bidet. This white and soft blue bidet is battery-operated (also available in white and soft pink). It has a waterproof body fitted with a foldable nozzle that can do a 180-degree rotation. It also has two buttons to control water pressure: a low and high setting. Its water container doubles as a protective casing for the bidet. ​This electric bidet is so lightweight and compact that it fits perfectly in your purse. ​Compared to other electric bidets. this one is a bit more expensive than others. ​It is lightweight and compact. ​Its nozzle folds in, and its water container transforms into a casing when not in use. ​This electric bidet fits perfectly in your purse. ​It’s more expensive than the others. 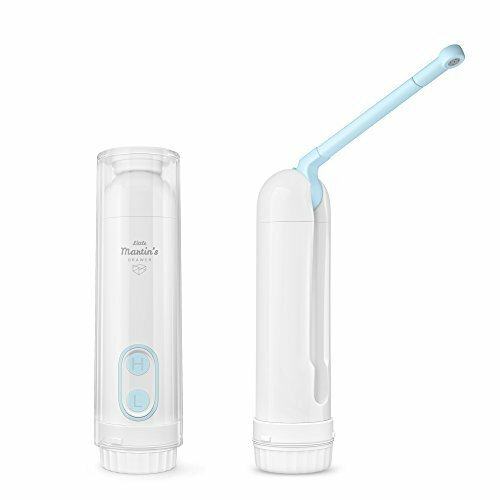 This white and baby blue portable bidet requires a battery-less operation. 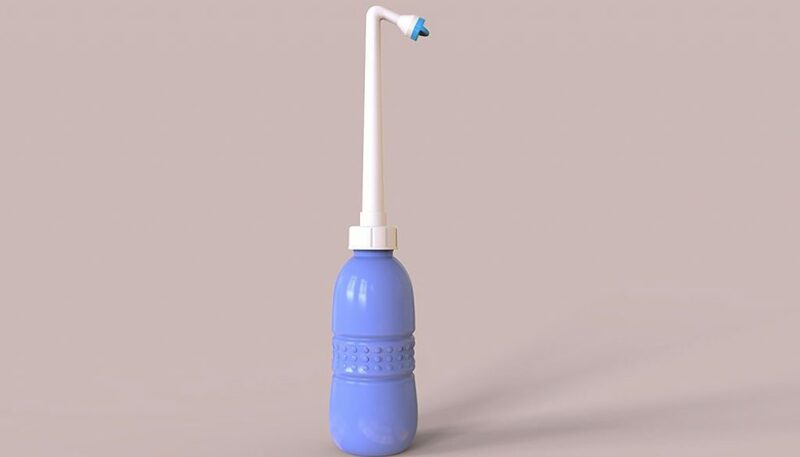 It is designed with a collapsible nozzle, an air vent, and a squeezable bottle. It can hold around 20 ounces of water. ​Its battery-less feature allows you to use it anytime. ​​The operation is not that smooth and clean. There are leaks, and you can’t prepare the waterway ahead of time because water will drip through the air vent unless you have your finger on it the whole time. ​A battery-less operation means you can use it anytime. ​Its retractable nozzle protects it from damage when not in use. ​It’s not that easy to operate, especially when you have to make sure that a finger is covering the air vent part when you invert it. It would have been better if it were some switch instead of an air vent at the bottom. ​​Manual operation allows you to adjust the strength of the water coming out of the bidet. You can go many levels of gentle and strong pressure. ​​While the air vent at the bottom is helpful in re-inflating the bottle, it also leaks water when it’s in an upright position. You have to have your finger at the bottom the whole time until you are ready to invert the bottle and squirt water out. ​You can use it anytime since it doesn’t need batteries or electricity. ​The air vent at the bottom allows you to get a steady stream of water. ​It’s a feat to use without creating a mess. You need to cover the air vent hole as you invert the bottle. Otherwise, you’ll have water spraying at the wrong places. Then, you need to squeeze the bottle if you want stronger water pressure. ​You may find it too big for your taste. Two of the products in review are both manual portable bidets and are basically the same. They share the same blue body and white nozzle design. There’s also the same air vent at the bottom that allows the bottle to re-inflate itself. Another unmistakable similarity is the retractable nozzle, which conveniently reduces its height for storage in your purse. On the other hand, Little Martin’s Electric Bidet is very much different from the other two. For one, this white and pink electric bidet is battery-operated. And instead of a collapsible nozzle, its nozzle neatly folds into a slot in its body. While the angles of the nozzle of the two manual bidets are fixed, the one that comes with the Little Martin’s version can be positioned anywhere from zero to 180 degrees. Plus, you don’t have to use grip power to adjust the water pressure of your bidet. You can just select between the high (H) and soft/low (L) buttons to adjust water pressure. Another design win for this electric bidet is that it has an auto-off function after a full 60-second operation or when water has run out. Then, when you’re done, you remove the water container at the bottom and use it to cover the travel cleaner. Comparing the two sets though would be like comparing apples to oranges since this one is an electric travel cleaner and the other two are manual bidets. So, to be fair, there are also advantages to using non-electronic bidets. The most obvious of that is you can use it anytime. There are no batteries dying on you. Plus, it’s cost-effective and more eco-friendly. All three portable bidet sprayers perform the job well. But you do get a better range of control on the water pressure with the manual types than with the two settings offered by the electric bidet. If you’re content with just the gentle and hard options, you’ll find Little Martin’s Electric Bidet perfect for your needs because it supplies a steady jet of water in either setting. You are also likely to struggle less with the electric one. You just invert it, make sure it’s angled correctly, and then push a button. 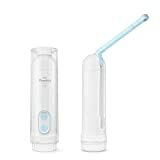 With both manual bidets, all the trapping of the water in with a finger until you’re ready, positioning the nozzle correctly, and the squeezing of the bottle just right will take more practice to master than with the electric one. The operation is expected to become smoother though as you get the hang of using a portable bidet. Clearly, Little Martin’s Electric Bidet costs more than the Home Comfort Essentials and Eco Home USA portable travel bidets. And it will eventually cost more, in the long run, taking into consideration that you’ll be using batteries to run it. If you are looking for the best portable bidet, either of the three is a good choice. The deciding factors here will be budget, the type of bidet that you want to own, and convenience. Could you tell me how heavy the electric Bidet is when filled with water compared to the manual? Also, with the air vent, is it hard to cover and squeeze at the same time? The electric has an adjustable nozzle that rotates but does not bend? What type of batteries does the electric bidet need and how many? The difference between the electric bidet and the manual when filled with water is not that significant at all. You just have to take into consideration the size of the particular portable bidet which you are using. It’s quite easy to cover and squeeze them at the same time as well. I have read through your post on Best Portable Bidet for my Hygiene kit. I have found it interesting. All three Bidet mentioned are convenient to travel with but I chose the Electric one, Even though it is more expensive I consider it to be more user friendly. Choosing the Electric Portable Bidet is a convenient & good option. It’s really the easiest one to maneuver out of the 3 ones listed. I hope you enjoy traveling with and using it. Does the electric portable bidet make a sound? I think it would be “off putting” to be making a motor sound in a stall in a public bathroom? Hi, Leissa, yes, there are convenient portable bidets on the market for those people who are busy and on the go. The Little Martin’s Electric Bidet has a little motor so it does make a very mild sound when it is in use. I was very surprised when I stumbled upon this article. I was not aware there was such a thing as a portable bidet. Personally, I think I would opt for the electric bidet because the makers developed it with the end users in mind. What I mean by that is they know the appropriate water pressure to use. Americans usually have no idea how to use a bidet. Personally, I have only used one in my entire life. This is because it was the only one I saw in a bathroom before and I was curious. It found that it did the job well. I imagine this product could pay for itself in toilet paper savings. I read before one of your articles and I learned a lot about bidets, I had no information about them and why it’s important to have at least one at home, but now I see the importance to have them at home. This time your article about Portable Bidets makes once again one great point to get one. It will be handy to get one of this for my next vacations. You pointed out a good point in this article about how much a person can spend on toilet paper every year, and having a bidet at home can help many people to save some money. Hi, Alejandra! Thank you so much for stopping by once more. I do remember you! I am glad that you found this article quite helpful as well. It’s all about providing the best recommendations and helpful articles to help you’ll make informed buying decisions. I’m always searching for new hygiene ideas that I can use, which has lead me to your site. Portable bidets… what a clever idea! Although my primary search was for hygiene, I never considered the amount of trees needed for toilet paper – just for me! I’m going to re-read the pros and cons for the different models in your article before I make my choice, but thought to first thank you. Thanks Sally! Glad that the article was able to help you! Do let us know if you need help finding anything else as you browse the site. 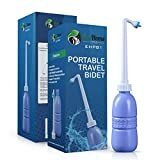 Hi, what a good idea I have never really considered using a portable bidet due to not much of the public is not exposed to the product due to a lack of poor advertising of the product itself. I like the fact that it applies to everyone that is able to use portable bidets and it is another option to keeping your private clean by washing away bacteria. This is an interesting product. Not many people would think of this. I think it’s neat that it is portable. I like how it reduces the amount of toilet paper used and thus reducing the amount of trees cut. The pros and cons: the pros are still winning. I would rather pay a little extra for good quality. The how-to videos are a good tool. Very nice site. A portable bidet may come in real handy especially for the ones who are traveling a lot! In usually middle eastern countries, the bidets are installed inside the toilet and you don’t need to seek water from an external source, but this isn’t the same in European countries and America. I definitely recommend people getting a bidet for themselves. It is one of the most useful items during your travels. Thank you for your valuable input here. Bidets are truly worthwhile as they help to reduce the use of toilet paper and is just overall more hygienic. The more we educate people about these products, the better it is for us.